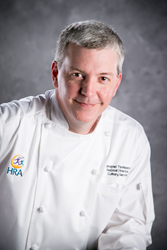 As National Director of Culinary Services, Christopher Thompson will be responsible for implementing new culinary programs and innovations in HRA’s growing number of communities nationwide. He will also be responsible for maintaining the high culinary standards of HRA’s Chef’s Fare Dining Program. We are very much looking forward to Christopher putting his own unique stamp on our dining service. Harbor Retirement Associates (HRA), a regional senior living development and management company based in Vero Beach, announces the appointment of Christopher Thompson as its new National Director of Culinary Services. Thompson will be responsible for implementing new culinary programs and innovations in HRA’s growing number of communities nationwide. He will also be responsible for maintaining the high culinary standards of HRA’s Chef’s Fare Dining Program. Thompson has more than 28 years of experience in the culinary and culinary education industries. He has served in many roles, including Executive Chef, Chef Instructor, Culinary Dean, Associate Director of Education and Director of Business Operations and Finance. He has also served as a corporate consultant for various properties and campuses over the years. Thompson studied culinary arts and hospitality management at the California Culinary Academy in San Francisco. He is a Certified Executive Chef through the American Culinary Federation and holds various other certifications through the National Restaurant Association. He has received multiple awards, including Educator of the Year for Academic Leadership, the prestigious L’Esprit d’ Excellence (The Spirit of Excellence) and Extraordinary Student Experience from Le Cordon Bleu-North America. Thompson is an 11-time recipient of Faculty of the Quarter during his years serving as a Culinary Instructor. Thompson is married to Anna, also a Chef, and they have a 7-year-old daughter, Ella. He and his family attend Saint Aidan’s Episcopal Church in Alpharetta, GA., and are “Cradle Episcopalians,” never straying from the teachings of the Episcopal Church. Christopher is an avid woodworker, golfer, musician and novice photographer. He and his family are enthusiastic campers and hikers and enjoy kayaking and exploring the North Georgia Mountains. HRA communities are found in 8 states nationwide. All HRA communities share similar features and standards of excellence. Each HRA community features include 24-hour staff, scheduled transportation daily, housekeeping service, concierge services and the exclusive Chef’s Fare Dining Program with customized dining experiences in multiple venues. Each community also has HRA’s signature Life Enrichment Program, designed to provide social, devotional, fitness and recreational opportunities that have a positive impact on residents.